Once per turn, Man Chong can select any character and discard any number of hand cards. The target must discard a hand card of a different type than any Man Chong discarded. If they do not, they flip their character card and draw X cards, X being the number of cards discarded by Man Chong. When Man Chong is damaged, he can show one of his hand cards. The source of damage must discard a card of a different type or Man Chong recovers one unit of health. When Man Chong activates "Corporal Punishment," the target must discard a card of a type not discarded by Man Chong. If Man Chong discards one basic card, the target must discard an equipment or tool card from their hand in order to avoid being flipped and drawing one card. If Man Chong discards a basic and a tool, the target must discard an equipment from their hand, or they will flip and draw two cards. If Man Chong discards one card of each type, it is impossible for the target to avoid flipping their character card and they would draw three cards. If Man Chong discards multiple cards of the same type for "Corporal Punishment", the target must still only discard one card to avoid flipping their character card. Man Chong can discard more than one card of each type when activating "Corporal Punishment." This increases the number of cards that the target can draw. For example, If he discards six Attacks, the target has two options. They could throw a single tool/equipment card or not through a card and be flipped, drawing six cards. If Man Chong's target of "Corporal Punishment" has no hand cards, they cannot avoid flipping their character card. Note that "Defense Strategy" is activated after Man Chong receives damage. If Man Chong is brought to the brink of death, he must first be saved with a Peach, Wine, or other character ability, then he can activate this ability and possibly recover a second unit of health. If Man Chong has no hand cards, he cannot activate "Defense Strategy." Man Chong is going to be difficult to test with the most recent version of QSanGuoSha, as it seems that the AI-controlled characters are deathly afraid of hurting him. "Corporal Punishment" can be very powerful, especially against characters with few hand cards. However, one using Man Chong should not underestimate the card advantage gained by the opponent whenever this power is used. 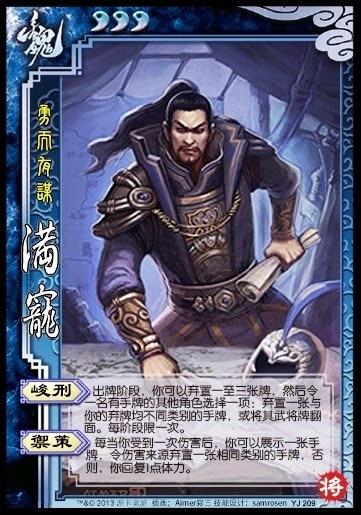 The card advantage is 2*X, where X is the number of cards discarded by Man Chong to activate the ability if the target is flipped. Man Chong can quickly find himself low on cards if he misuses this ability or uses it frequently. "Defense Strategy" is nice because it forces an opponent to discard an additional card to hurt Man Chong. Also, if an ally inadvertently damages Man Chong, this ability can be used to 'undo' the damage. It is important to note that Man Chong is weak against card destruction techniques, as "Corporal Punishment" requires him to discard cards to activate and he must have at least one hand card to activate "Defense Strategy." All in all, Man Chong will be a feared character, though he definitely has some flaws.